A missing Kansas State University student has been found. The family of Garrett Kipp tells KSAL News he has been found. He was on the road most of the time, along Interstate 70. He was found in St. Louis. At this point he as well as can be expected. Kipp had been missing since Thursday night. His vehicle was found abandoned near Natoma in Osborne County. He abandoned his truck and walked overnight Thursday night into Friday morning from Natoma to Russell, approximately 28 miles. There was a sighting of him at the Casey’s General convenience store in Russell at around 10:00 Friday morning. His cell phone was found about a quarter of a mile away from the truck. 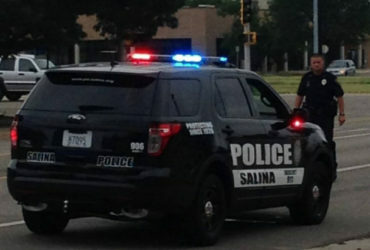 A search for a missing Kansas State University Student continues. Authorities are looking for 20-year-old Garrett Kipp, who went missing on Thursday in Osborne County. Kipp’s vehicle was found abandoned near Natoma in Osborne County. He abandoned his truck and walked overnight Thursday night into Friday morning from Natoma to Russell, approximately 28 miles. There was a sighting of him at the Casey’s General convenience store in Russell at around 10:00 Friday morning.Kipp’s cell phone was found about a quarter of a mile away from the truck. It is not known of Kipp is still in Northwest Kansas, or perhaps if he is headed east to Manhattan or west to Colorado. Kipp is a student at Kansas State University. His family lives in Garden City. The Osborne County Sheriff’s Office, Russell Police Department, Hays Police, and Fort Hays State Football team among others have been active in trying to find Kipp. Anyone with any information on where Garrett Kipp might be is asked to contact the Osborne County Sheriff’s Office 785-346-2001. 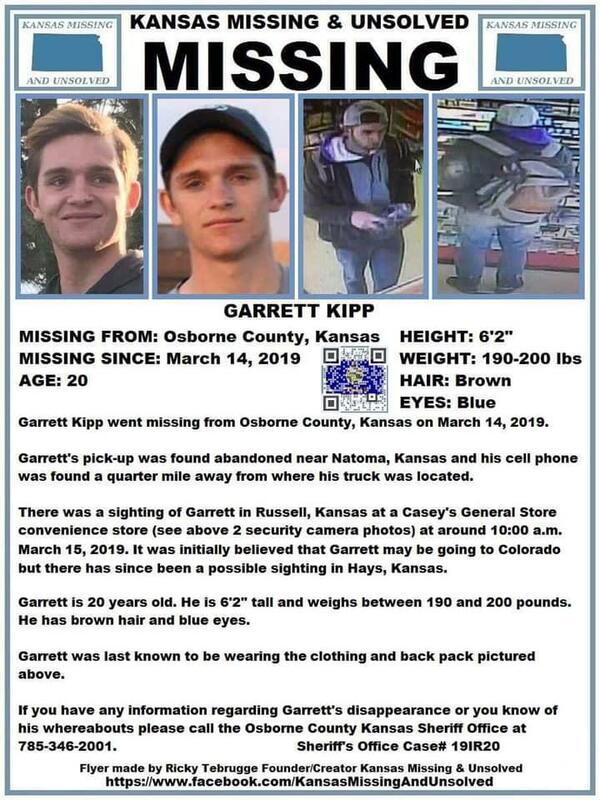 ORIGINAL: Family and friends are looking for a man who went missing in Osborne County.Authorities are looking for 20-year-old Garrett Kipp, who went missing on Thursday.Kipp’s vehicle was found abandoned near Natoma in Osborne County. 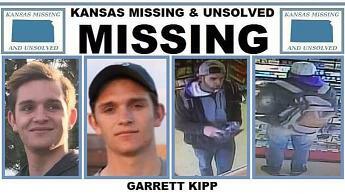 His cell phone was found about a quarter of a mile away.There was a sighting of Kipp at the Casey’s General convenience store in Russell at around 10:00 Friday morning.Anyone with any information on where Garrett Kipp might be is asked to contact the Osborne County Sheriff’s Office 785-346-2001.